I had shepherd’s pie a while ago and honestly, it wasn’t very good. It was actually pretty bland. But since it’s one of my boyfriend’s favorite dishes, I revisited the dish and decided that there has to be more to it, more flavor, some reason why he likes it so much and of course that means I had to recreate the dish Kat style. This dish is also great because you probably have most of these ingredients in your fridge or freezer. Try out my version, with the recipe below! Fill a big pot with lukewarm water. Peel and quarter potatoes, add to the pot, and set it on high to boil (about 20 minutes). While the potatoes are cooking, melt 4 Tablespoons butter (1/2 a stick) in a large frying pan. Sauté onions in butter until tender over medium heat and cook for 5 minutes. 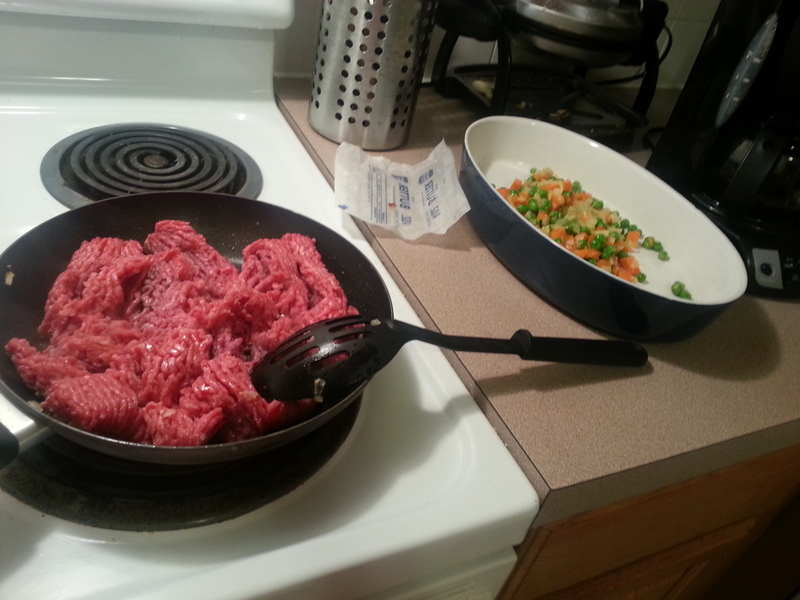 Set veggies aside in a bowl add ground beef and sauté until no longer pink. Mix the veggies back in. Add salt and pepper, worcestershire sauce and half a cup of beef broth and cook, uncovered, over low heat for 10 minutes, adding more beef broth as necessary to keep moist. Mash potatoes in the pot or in a bowl with butter, sour cream and season with salt and pepper to taste. Place beef mixture in a baking dish, distribute mashed potatoes on top, and roughen them up with a fork so that there are peaks that will brown nicely. Have fun with it and make a design! Bake in 400 degree oven until the top is golden brown (about 30 minutes). If its not browning, broil for last few minutes if necessary to brown. That’s it! This is a great dish that everyone will enjoy.